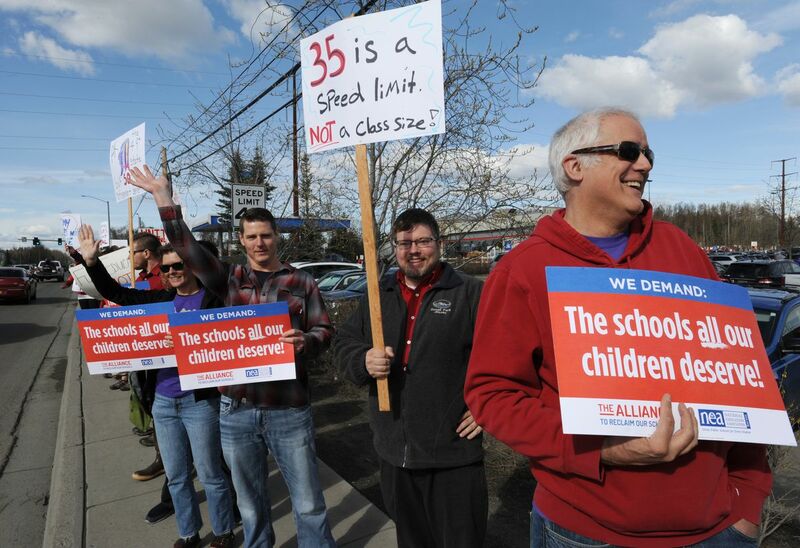 The Anchorage School District and the teachers union that represents about 3,300 of the city's educators have reached a stalemate in contract negotiations. They agreed Thursday night, after about four hours of bargaining, to bring in a federal mediator to help. "We're kind of deadlocked," said Tom Klaameyer, head of the union, the Anchorage Education Association. "We're at the point where it feels like we're just spinning our wheels. We're both saying the same things and we're both not satisfied with the movement of the other side, so we're getting nowhere." In interviews Friday, both sides said they're hopeful to reach an agreement with the help of a mediator. But they remain at odds over a list of items. The union wants teachers to have more autonomy in the classroom and more of a voice in the selection of curriculum and programs, Klaameyer said, among other asks included in its contract proposal. The two sides also disagree over salaries and health benefits. The union and the district started bargaining in April, Klaameyer said. The union's contract expired on June 30. Educators continue to work under its terms. Those represented by the union include teachers, counselors, librarians, school nurses and others. "We have every interest in reaching a contract settlement," said Todd Hess, the district's chief human resource officer. "We think we have top-notch educators in the district and they're out there doing a good job." Hess said the district wants to be fair and equitable. It also has a budget to balance. "It sounds like a broken record and I apologize for it, but there are fiscal constraints that we don't necessarily have control over," he said. According to the district's estimates, the union's contract proposal would cost an additional $54 million over its three years. Klaameyer said it's not necessarily unusual for the union and district to agree to a mediator. They last did in 2012, and the mediator helped them reach a three-year contract agreement, he said. "It's a normal and prescribed part of the collective bargaining process for negotiations nationwide," Hess said. The mediator comes from the Federal Mediation and Conciliation Service. The federal government pays for the mediation services, Hess said. Instead of the bargaining teams for the district and union talking directly, the mediator goes back and forth between the two sides and tries to find a compromise, Klaameyer said. The bargaining process is outlined in state law. After mediation, the district and union can decide on a contract, go back to bargaining or go to arbitration, Hess said. Klaameyer said the union isn't planning a strike. "It's not even on our radar," he said. "The process of good-faith bargaining has to continue. I know some people are frustrated with how long it's taking. You've got to let the process work."